International O´key Language School offers courses via Skype for those who want to learn a foreign language or enhance their current level of language but either do not have enough time to attend a standard course, or live too far from the school premises or even live abroad and do not have the opportunity to study with native speakers. Online courses are conducted by professional teachers who are native speakers. This gives you an amazing opportunity to learn how to correctly deliver a speech or presentation, develop listening skills, expand your vocabulary, and ultimately eradicate the language barrier. The content of the online course is in keeping with the general course but the online course is adapted to match the scope of distance learning, your goals and objectives. Despite the distance, lessons help you to develop all the necessary language skills: reading, understanding of spoken language, speaking, writing and accurately expressing your thoughts. During lessons you will communicate with the teacher and also complete written exercises exactly as you would in the classroom. 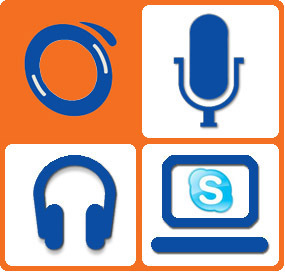 For successful online learning you will need a computer with a reliable Internet connection, microphone and headphones, standard Microsoft software and Skype. ** For individual courses of international exam preparation and business courses there is the same price list + 10%. Studying in pairs***: Adults and children from 12 y.o.